**Kit received as part of the Dayspring Illustrated Faith Launch Team. Post contains affiliate links. All thoughts are 100% my own. January certainly is the month of goals isn't it? We've set New Years Resolutions for our fitness, our diets, even our homes. THIS is the month that we vow to get it all done and to start making improvements on our lives for the better. For Christians, a common resolution that many share is that to read the Bible. That's a great goal, isn't it? But the common issue with resolutions is--- they're often so hard to keep! So today, I'm sharing some thoughts on how to best keep those Bible reading goals in 2018. Consider Your WHY. First and foremost, it's important to consider why you plan to make Bible reading your goal. Is it because you feel like you *should* as a 'good Christian'? Or is it because you truly want to strengthen your relationship with God? I've found it's much easier to stick to these goals when it's something you truly want to do. Schedule It In. Sometimes in the craziness of life, we can get to the end of the day and realize you didn't get any time to read your Bible that day. So rather than waiting for the time to open up, schedule it ahead of time. It doesn't have to be long- 15 minutes while you drink your coffee in the morning will do- but make it a point to add to your day. Use a Reading Plan. If your goal is to read through the Bible in a year, find a reading plan that helps you to do so. Many Bibles have this resource, or you can find many reading plans online too. If your goal is just to read the Bible more, consider at home Bible studies or topical reading plans too. Join a Study Group. Sometimes the best way to reach a goal is to have someone to be accountable to. Joining a study group at your church can help with that... but also helps you to dig deeper by getting various perspectives on what you are reading. Find the Right Bible for You. I think to truly accomplish your Bible reading goals, you'll need to find the perfect fit for you. You'll want a translation that is readable and easy to understand for YOU. Consider styles and how you best connect to the Bible- study? devotional? journaling? When you have a Bible you love, it helps to make you want to reach for it. Try, Try Again. I think the issue with many resolutions is that when we fail, we feel that the new year is over and it's too late now. We figure we can just start again NEXT year... and so the cycle continues. But if we make it a DAILY goal, each day is a new day to try again. We're human, life happens, but just keep moving forward. Make It Personal. Reading the Bible is not a one size fits all. Some people thrive on history and connect best when they learn the history of the Bible. Some people are social and thrive on connecting with others through their Bible reading in a group. And for some, like myself, we crave a more creative aspect to connect to what we are reading and have found that connection via Bible journaling. Find out how YOU connect to the Bible on a more personal level and make it your own unique experience. 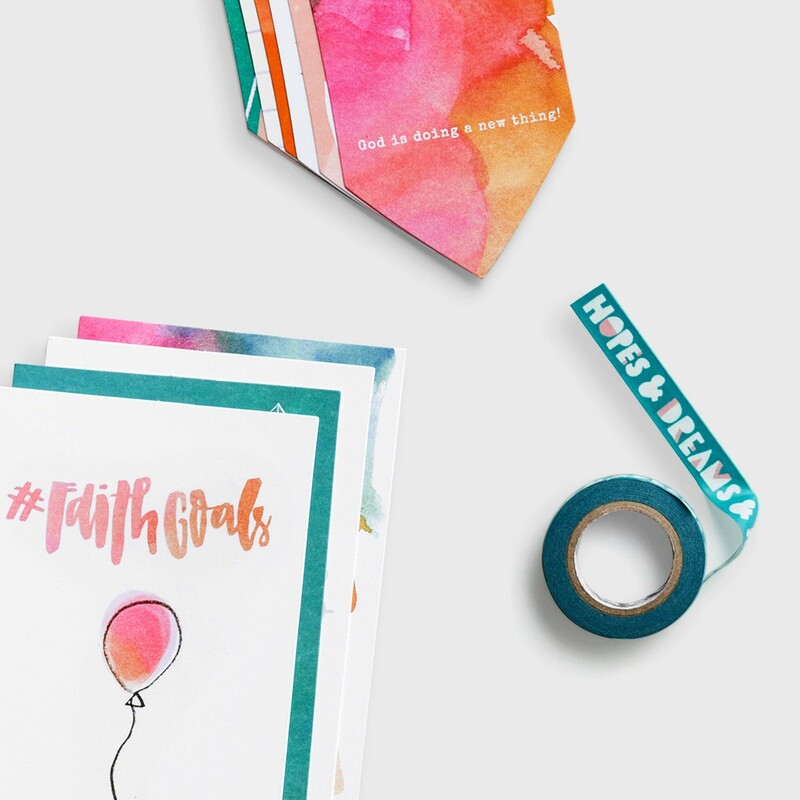 If you are a creative person and want to start connecting with God on that level, the start of the year is a great time to dig into Bible journaling. And the new kit, appropriately titled #Goals can certainly help. It is available to purchase TODAY at Dayspring. And for THREE DAYS ONLY with every kit purchase, you will receive the Illustrated Faith - Topics - 47-Piece Tabbies Set absolutely FREE! They will be added to your order automatically at checkout. Don't forget to use the code IFSHIPSFREE for free shipping! Do you have goals to read your Bible in 2018? Or to start journaling? How can Bible journaling/Illustrated Faith help?